Gait is simply one’s natural way of walking. However, different people will have different ways of walking that are more or less natural to them based on how their body is proportioned and formed. For most people, one’s gait occurs in three distinct steps. The first of these three steps begins with what is known as the stance. In this step, the person shifts their weight onto their stationary foot and stabilizes to balance as they move. However, the stance phase of gait does not occur individually in a normal, healthy walking motion. This step is always accompanied by the swing phase which occurs simultaneously on the opposite side of the body. Conversely to the stance step, the swing step entails the leg being suspended in the air while in motion. In between each alternation of the stance and swing steps within a normal gait is what is known as the double stance step. This is the point when both feet are on the ground, with the stance step one foot on its toes while the swing step foot’s heel strikes the ground. It is at this step that the weight and balance from the stance step foot are shifted to the concluding swing step foot. Likewise, once the weight from the previous stance step foot is effectively shifted to the previous swing step foot, the roles of each foot and leg reverse, thus ending the double stance step and beginning a new cycle of the stance/swing step dynamic. In a normal healthy gait, the arms swing rhythmically in opposition with the feet on their side. Thus, a foot in the stance step will have the corresponding arm swing forward while a foot in the swing step will have an arm swing back. This allows the body to further balance and stabilize its motion through the gait. 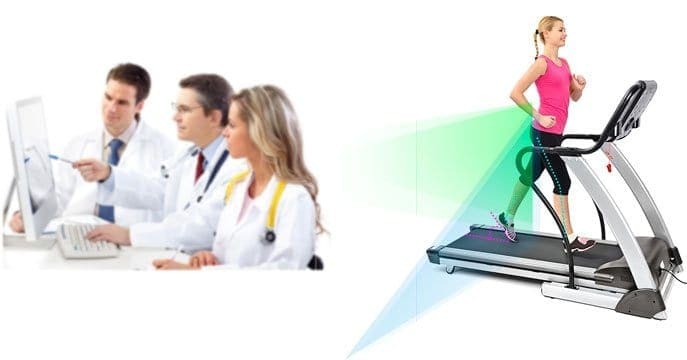 Together, with the coordination of x/y/axes via the vestibular function, the body is able to maintain a normal gait. Two of the more common causes of a gait disorder occur due to soft tissue damage or dysfunction or nerve injuries. Moreover, one of the conditions may cause or exacerbate the other. For instance, lower back pain can cause the muscles to tighten to provide stability and decrease flexion and extension which give rise to pain in damaged muscle groups. Over a long enough period of time, this continued tightening of the muscles due to lower back pain can cause the muscles to stay in a contracted state which can compress or impinge the nerve. Similarly, a compressed or impinged nerve can cause pain or muscle weakness through inhibited enervation, which may in turn cause the associated muscles to contract, either to compensate for the weakened muscles or to stabilize and minimize pain. Over an extended period of time, this induced state of contraction can lead to lower back pain without other sources of muscle injury present. Nerve injuries can also be caused by the dysfunctional condition in the spine, such as herniated disks or other bone-related conditions like with bone spurs. Regardless, nerve injuries can be one of the more persistent and pernicious conditions that cause gait dysfunction, and each specific nerve injury can affect one’s gait in a different way. However, by examining the way a person walks, it can be easier to diagnose and treat the disorder. Yet, different nerves will more prone to different types of damage whether they are compressed between muscle, between bones, between a muscle and a bone, or between some other combination of soft tissues. It is important to understand not only the nerves that may be impinged and cause a gait disorder but also which soft tissues need treatment to alleviate compression on a specific nerve. There is a host of soft tissue conditions that can contribute to a disorder of the gait, such as lower back pain, but one of the most common causes is joint pain. Pain in the joints can be acute, but the chronic joint pain will often be caused by either arthritis or osteoporosis. However, this will generally be examined as a cause of gait dysfunction after the clinician has already ruled out nerve injuries. The most common joint affected by walking conditions will be the hip, knee, or ankle joints, though joints of the tarsals or metatarsals and even joints in the spine can contribute to gait disorders caused by soft tissues. One of the common nerves compressed which cause a disorder to one’s gait is the S1 or the first Sacral spinal nerve. This is the nerve responsible for enervation of the gluteus muscle group as well various muscles and muscle groups in both the pelvis and posterior thigh as well as the calf muscles. Damage to this nerve is generally what causes sciatica which can cause immense amounts of pain and severely hinder the normal walking motions. Combined with other sacral and lumbar nerves, the S1 constitutes part of the Sciatic nerve. This nerve is most commonly injured by disk herniation, though degenerative disk disease or a fracture in the fused joint between the S1 and the L5 nerves can also cause nerve compression. The L5 as suggested prior, is another nerve that can often cause issues with the walking motion, though this nerve will general cause issue with the swing step, as opposed to the stance step. Due to its close proximity to the S1 nerve, the L5 nerve will often suffer compression for similar reasons—generally spine or disk related in nature. However, the L5 enervates muscles groups not affected by S1 enervation, so careful examination is necessary to distinguish the source of a gait dysfunction between nerves so closely positioned. While the L5 shares some enervation duty with the S1 in regards to the gluteus muscle group, L5 injuries can often be distinguished from S1 injuries by a weakness or other dysfunction when walking in the Tibialis Anterior muscle. If the foot cannot dorsiflex when transitioning between the stance to the swing step while walking, there is a possibility that the L5 is injured. However, this can also signal an issue with the next superior spinal nerve, the L4. Continuing superiorly up the spin past the L4, the L3 will present issues with the walking motion during the stance step. This is due to the fact that the quadriceps are enervated by the L3 and the quadriceps are responsible for much of the stabilizing mechanism in the leg during locomotion. If there is an issue with the L3, the patient may present by locking the knee so that the weakened quadriceps muscles do not give way. Moreover, the patient is unlikely to stand with a bent knee on a leg that is suffering from diminished enervation due to nerve compression of the L3. If the weakness is server, the patient may even experience the knee buckling, and they may fall. However, patients will often compensate for this condition by locking the knee during the swing step and simply vaulting on the leg to avoid placing too much stress on the quadriceps. Problems with the first and second lumbar nerves are relatively easy to identify. If these nerves impinge, they will not be able to enervate the psoas muscle group as well as the iliac. These are the muscles directly responsible for hip flexion, and if they are too weakened, the patient will be unable to bring the leg forward during the swing step of the walking movement. Instead, the patient will generally adapt and swing the leg forward with a thrusting rotation from the hip. Due to the exaggerated nature of the motion necessary to walk with L1 and/or L2 nerve injuries, it will be less difficult to identify.